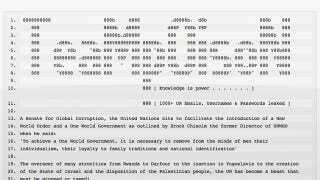 The tech security gurus at the United Nations just got quite a startle: A team of hackers posted about 1000 login credentials for United Nations staff members on PasteBin. Apparently a large number of the passwords were simply blank. Seriously, guys? After LulzSec? The hackers at TeamPoison reportedly exploited a security vulnerability on the UN Development Program website to obtain the usernames and passwords of UN Staff. The group's post on PasteBin accuses the UN of a long list of crimes ranging from mundane corruption to more existential transgressions like trying "to facilitate the introduction of a New World Order and a One World Government" which would necessitate crushing human individuality. Sheesh.